That is what happened to Nicole Rogers--born and raised in New Orleans she had recently moved to Red Cedar. She had changed her life around--lost lots of weight--was in a committed relationship--when voodoo dolls started appearing. She met up with Liz Lucas via a friend she met in a gym. Now Liz was about to go to a cooking school in New Orleans to learn a few new recipes for her restaurant/spa, when she got one of her "feelings". She drove over to Nicole's house and found her murdered! But who could have done it? So many suspects! Can Liz ferret out the person responsible for all this? She did come back with some real Cajun recipes that you can find at the end of the book! What is the connection between Nicole’s murder and the voodoo dolls? 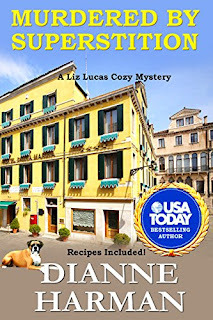 Liz Lucas, an amateur sleuth, is determined to find the connection and catch the killer. 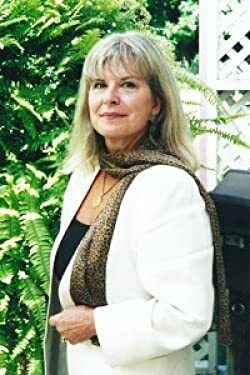 While on a trip to New Orleans to attend a cooking school known for its Cajun-Creole style of cooking, she learns a lot from a gris-gris doctor who specializes in voodoo, hexes, spells, and superstitions. But who would want to kill Nicole? Was it the bank employee Nicole fired? What about Nicole’s sister, who had legally changed her name to Marie Leveau (the Queen of Voodoo in New Orleans)? Or Candace Norgan, the woman her fiancé dropped when he fell in love with Nicole? Or even Maddie, Nicole’s friend and the Assistant Manager at the bank? Anyone 18 years of age or older may fill out the Rafflecopter below for a chance to be the one lucky winner WW to win $25 Amazon or PayPal.. Rafflecopter will be used to pick the winner. I will email the winner who must reply to my email within 48 hours with the email address they need the Amazon or PayPal sent to. I will then forward this info to the author who is responsible for getting the prizes to the winners. I am a little superstitious. I have not read any of her books yet. I would like to check out, Murdered by words. It look interesting. I am sure I would love the recipes in this book. I'm a little superstitious. 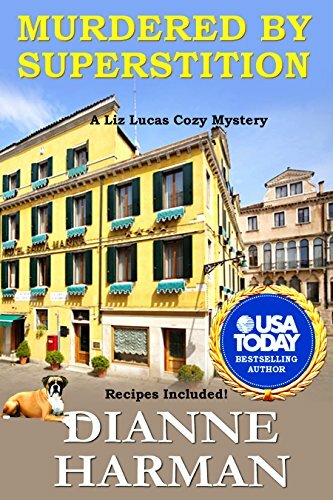 I haven't fully read any series written by Dianne Harman. I would like to read Murdered by Superstition. I would probably like some of the recipes in this book. I, too, am superstitious about the number 13. I won't stop on page 13 of a book nor chapter 13 of a book. I have read the Midwest Series. I would love to read the Liz Lucas series. And yes! I would love to try the recipes as well. Not really! Thank you for your giveaway and a chance to win. I don't consider myself superstitious at all. This book looks like one I would really enjoy! I am not really superstitious but I can't say that I like Friday the 13th. I have read all of her series to date. Yes I am one thing I am superstitious about is when a black cat crossing the street in front of my car. I usually X the windshield with my finger for protection from bad luck. Im a little superstitious about somethings.